ANAHEIM, Calif. -- After 17 grueling periods crammed into just four games, the Anaheim Ducks have no doubt they can play at hockey's highest level with the Chicago Blackhawks. Heading into a pivotal Game 5 on Monday in the Western Conference finals, the Ducks also realize their two gut-wrenching overtime losses were missed opportunities to take out their veteran, playoff-tested opponents - and they can't afford two more. Chicago evened the series at two games apiece on Saturday night with Antoine Vermette's goal in double overtime. The 5-4 win was the Blackhawks' fourth OT victory of an increasingly charmed postseason. Anaheim still hasn't lost in regulation in the entire Stanley Cup playoffs, but Chicago has a knack for big moments that the Ducks haven't matched in this series. So the Ducks will keep hitting hard, skating well and hoping the late-game bounces - and a few more whistles - start going against Chicago. "I think (the Blackhawks) know they're in a series," Ducks coach Bruce Boudreau said Sunday. "I mean, I don't think they think they've had it very easy. It's our job to continue to make them feel that way." Both teams spent Sunday flying to the West Coast and resting up for the next collision in an already draining series. The Ducks have followed through on their plan to batter the Blackhawks' short-staffed defense with relentless checking and hard hits, but Chicago is surviving so far. "We're just going to keep with our game plan," said Ducks center Ryan Kesler, who has been matched against Chicago captain Jonathan Toews all series. "I think it will wear them down. It's going to wear them down. No human can withstand that many hits. We're going to keep banging out there and going after them." The Blackhawks were credited with 52 hits of their own in Game 4, but that shaky defense also allowed three goals in 37 seconds in the third period, blowing a late two-goal lead. The defensemen playing heavy minutes don't acknowledge any damage from Anaheim's cumulative pressure: Brent Seabrook dismissed the idea with a shrug and a smile. "I think it's both ways," Chicago winger Bryan Bickell said. "They are wearing us down, but they're getting tired from wearing us down." And for all the entertainment value of the first four games, one other aspect of this series is clear from the franchises' first playoff meeting: These West powers have already learned to dislike each other. 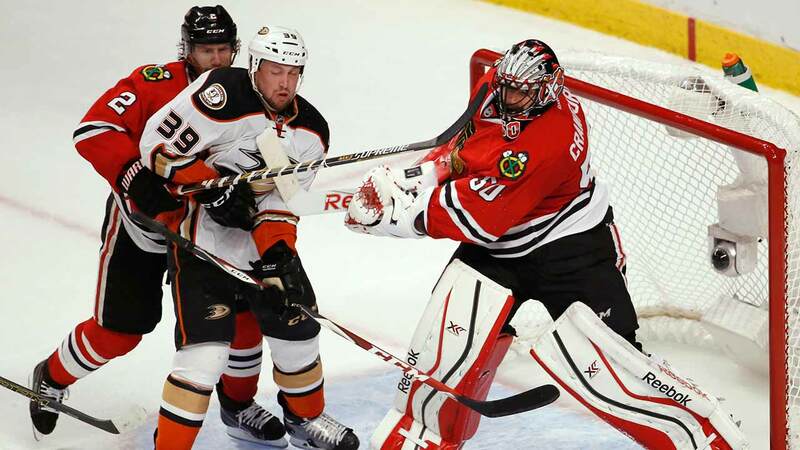 Chicago goalie Corey Crawford exemplified the growing mutual distaste late in regulation of Game 4 when he delivered an unpenalized, two-handed slash to Matt Beleskey's chest, nearly letting in a winning goal in the process. Afterward, Beleskey said he is "sick of" the Blackhawks. "This series is pretty amazing," Chicago coach Joel Quenneville said. "Every game is very close, very competitive. The road to trying to win the Cup has some amazing swings and highs, lows and twists and turns. The deeper you get in series, it is all the more challenging. Our group's experience and know-how and the will to find ways, last night was a great demonstration of that." A five-goal performance in Game 4 was a boost to the Blackhawks, who managed just three even-strength goals in the first 14 periods of this series against Ducks goalie Frederik Andersen. "I thought the last game was a big step to find the back of the net against Andersen," Bickell said. "You see that he is kind of human, because he's been standing on his head as of late." The Blackhawks also have benefited from a distinct advantage in penalties, with just 22 minutes in the box compared to 38 for Anaheim. The Ducks are trying desperately not to criticize the officiating, hoping they'll be rewarded later. The Ducks realize the stakes at Honda Center on Memorial Day, but Boudreau ordered his players to spend their Sunday thinking about anything but hockey. They hope their season-long knack for winning one-goal games will show up again late in a series being decided by thin margins in every aspect. "It's about responding," Anaheim captain Ryan Getzlaf said. "Everything that we designed this team around this year, I think, was our ability to put things past us and move on and keep playing, and not let things affect us outside the game, or from game to game. So I think we get right back at it again, anxious to get back on the ice after a disappointing loss. We've been able to do that so far." NOTES: Quenneville said lineup changes are "not likely," while Boudreau is considering a shuffle in his forward lines. Tomas Fleischmann or Chris Wagner could get back into the lineup, Boudreau said.